At 14, I met Matt, a youth minister at our camp, where he happened to be volunteering that summer. He would go onto become a mentor to me through my teen and young adult years. After my first surgery, they sat me down and told me they were not sure I would ever be able to get pregnant. I was devastated. One night, I sat in tears talking to him, wondering out loud who would ever want to marry me knowing that I may never be able to carry their child. He reassured me. Someone would be out there. Only to find out, he could not have children. He and his wife had to adopt. AND, GOD GAVE ME HOPE… I would still find someone to spend my life with. A week later, Chris and I began dating. In the interest of honesty before we got overly involved with each other, I sat Chris down one night and told him I may never be able to carry a child with him. He reassured me. He had two adopted brothers, two adopted aunts, and another aunt and uncle financed a children’s hospital in El Salvador that was tied in with an orphanage and his best friend was adopted as well. AND, GOD GAVE ME HOPE… It did not matter whether I could have biological children with him. We got married and moved to our first house. On the day we moved in, two people pulled into our driveway to introduce themselves as our neighbors. As time went on, we became close friends. As our fears of not being able to get pregnant were being realized, Tina asked how I was doing with it all. She reassured me. She had gone through infertility treatments to get pregnant. She knew the heartache. AND, GOD GAVE US HOPE… He would provide support for us while we walked this path. As the years of treatments wore on, we finally reached a point where there were not more treatment options for the endometriosis and I was so ill, I could not function. We made the decision that it was time to pursue a hysterectomy. We were devastated. An hour after finalizing our decision, we got a phone call. Unknown to us, our nephew had been born during the night. As I held him, I was overwhelmed by the realization that I loved him so much that I would go to the ends of the Earth for him. AND, GOD GAVE US HOPE… We could love a child, immensely and unconditionally, that did not come from my body. For a couple of years after the hysterectomy, we struggled back and forth trying to decide the if’s and when’s of pursuing adoption. We decided I would go back to school and put the decision off for a couple of years. The following week, we found out about an expectant mother looking to place her unborn for adoption. We worked through the months getting ourselves, prepared with an agency to adopt. AND, GOD GAVE US HOPE… We knew in the depths of our hearts how much we wanted to be parents. The expectant mother decided to parent the child. We were devastated. We searched our souls, longing to know why God would place us in a situation with so much hope, only to be hurt in the end. Three weeks later, through a co-worker of mine, we found out about our son’s birthmother. Thanks to the first situation, we were completely prepared and ready with people to help guide her through the journey. AND, GOD GAVE US HOPE… We would have a family. I believe in coincidences, but not this many. Infertility is not all that common. I could have met any other youth minister, but God game me one who had already walked the journey I was starting on. 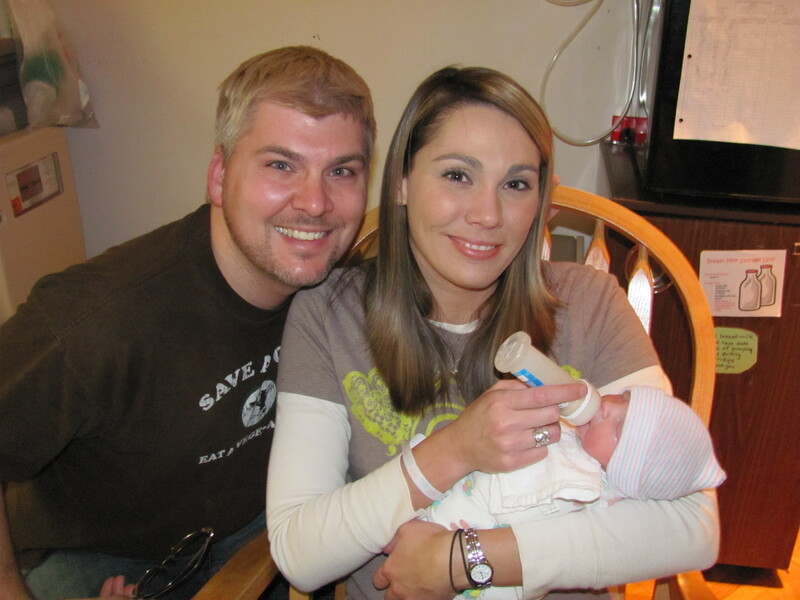 I could have met any other guy, but God gave me a husband that was familiar with adoption. I could have had any other neighbors, but God gave us ones who had experienced our grief and could support us through this journey. We could have avoided the heartache of an adoption falling through, but god gave us a situation to prepare us. I could have worked in many other places, but God gave me a place through where I would meet the birthmother of our son. There is not a doubt in our mind of God’s hand at work, providing for our every need through this journey. Thus, why the meaning of our son’s name is “God has strengthened”. We could not find a more fitting name to capture the journey we had to becoming his parents.